1. The mutakifeen started to reach Minhaj-ul-Quran Mosque, situated in Township, Lahore at 9 A.M.
2. Ten gates were set up for the entrance of the mutakifeen along with main big gate from where only occupants of particular block were allowed to enter and get their place. 3. The City of I'tikaf was divided into two parts that consist on eighteen blocks. For the very first time in the history of I'tikaf, Minhaj Cricket Ground adjacent to Minhaj mosque was being used for I'tikaf. All the blocks set up there had been filled before the mid-day prayer. 4. The major work done for the mutakifeen's convenience was cord roof over the courtyard of the mosque and hundred of fans were set up to cool the environment and surroundings. 5. The security of the occupants has been made sure and secret cameras were set up at particular place to avoid any disastrous situation. 6. This year the vendors and shopping centres have not been allowed to sell their things and set up their shops around the place but they were allocated particular place where they can set up their timely shop after registration. 7. A large number of security guards were there at the main gate of Minhaj mosque. Along with them, hundreds of Guards were appointed at all the four sides of occupying place. 8. Different helping sign boards were set up on all the roads leading to the city of I'tikaf for the convenience of the people coming for noble cause of Allah. They were also illuminated with multi-colour lights. 9. There were only few policemen present to ensure security. Dr. Raheeq Ahmad Abbasi expressed his regret over indifference of City Govt for not making ensure foolproof security system. 10. Fifteen hundreds men have been assigned different duties to facilitate the mutakifeen. 11. A separate Cell has been set up where the mutakifeen can submit their valuable things and money to avoid any loss or mishap. 12. The mutakifeen exercised discipline and maintained queue while getting into their particular blocks. 13. A separate dispensary was set up in each block and MBBS doctors have been appointed to ensure sound health of the mutakifeen. 14. Shaykh-ul-Islam's books, audio & video cassettes and CDs are available at the sale centre set up adjacent to Minhaj mosque. 15. A well-known and veteran jurist of Minhaj-ul-Quran Mufti Abdul Qayyum Hazaravi shed light on different aspects of I'tikaf and its place in Sharia. 16. Dr. Raheeq Ahmad Abbassi, along with Sheikh Zahid Fayyaz and Sajid Mehmood Bhatti gave a briefing to the journalists at 5 P.M.
17. All the people came for the noble cause had their first Iftar at Minhaj with smiling face and happiness. They appeared to be alive and enthusiasts as they were going to benefit from the heavenly company of shaykh-ul-Islam for ten days to come. 18. After evening Prayer Dr. Raheeq Ahmad Abbassi welcomed all the people came for adoration from all the corners of the country and abroad. 19. A vast majority of people was occupying their places at 7 P.M. in the courtyard of the mosque just to get a closer place to Shaykh-ul-Islam. It is important to note that the time for Isha Prayer was 8:30. 20. Minhaj Production and media cell set up a stage for Shaykh-ul-Islam before the end of Isha prayer. 21. Shaykh-ul-Islam Dr. Muhammad Tahir-ul-Qadri arrived at the Mosque at 8:23 P.M. He greeted the people and accorded a warm welcome to them. He specially appeared on the stage set in courtyard of Mosque to view the people. Sahibzada Hussain Mohy ud Din and Dr. Raheeq Ahmad Abbassi accompanied him. 22. The Taraveeh Prayer was completed at 10:30 Three different Qurra (reciters) got the privilege to recite the holy Quran in their melodious sound. 23. Before Shaykh-ul-Islam's speech, Bilali Brethren, famous Nashid artists read the naat of Aqa (SAW). 24. Syed Ali Ghazzanfer Kararvi, Agha Murtaza Poya, Syed Agha Ali Musvi, an Iranian Consulate were the chief guests on the very first day of I'tikaf. They were occupying the chairs set on the right and left of Shaykh-ul-Islam. 25. 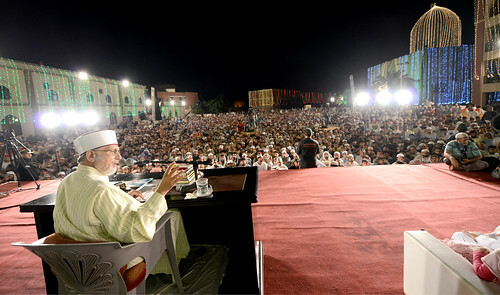 Shaykh-ul-Islam started his speech at 11:49 and ended at 3:20 A.M.
27. After the speech Dr. Khalid Ranjha supplicated to Allah Almighty in a very emotional way.